My name badge from the Summit! I’ve just completed attending the 2nd Summit of the Future of Undergraduate Geoscience Education at the University of Texas at Austin (TX). I attended the 1st Summit almost exactly two years ago and blogged about it here on the Journeys of Dr. G blog (see posts Pre-Workshop and State Capitol, Day 1, Day 2, Day 3, Wrap-Up). Since I started blogging on geoscience education, educational technology, and science communication for the American Geophysical Union (AGU) at GeoEd Trek in May 2014, most of my “academic” blogging is taking place over there (the posts from this Summit are over at Day 1, Day 2, and Day 3). But I don’t want to neglect this blog and the audience of students (and others!) that read these posts, so I’m writing one post to wrap up my recent conference travel – the first work-related travel for 2016! 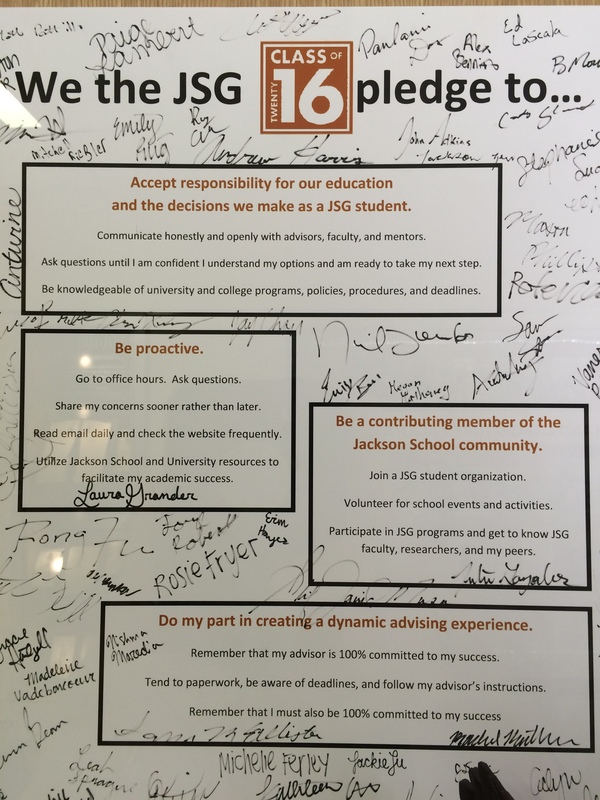 An idea from UT-Austin of something for all of the new Environmental Science majors each year – have them sign a pledge that is displayed with great ideas/reminders of what it takes to be a successful student! This 2nd Summit was targeted for heads and chairs of geoscience and Earth science-related degree programs, as well as other academic leaders. I decided to attend this Summit to be pro-active in getting prepared for a possible/probable four-year degree program Penn State Brandywine is adding – a B.S. in Environmental Science. For the past 15 years at PSU Brandywine, all I’ve had to worry about is my courses, the student learning outcomes of my courses, meeting the general education science requirement, and making sure my Earth & Mineral Science advisees are ready for their transfer to the Penn State University Park campus to complete their degrees. Going from being a “lone ranger of geology” to suddenly chairing a program and hiring/mentoring new faculty is a big transition – but it is a career transition and challenge I am more than ready for! There are several geoscience concepts identified by the geoscience workforce that all undergraduate programs should be focusing on, including Earth as a complex system, deep time, climate change, etc. How will I answer these questions in the future with the new program… Is my department doing a good job producing scientists? What are the attributes required of being a good geoscientist? What extracurricular training is needed? Who has responsibility? This is going to take a whole student approach by everyone! Lina Patino, a program officer from the National Science Foundation posed this question to the group at the end of our Summit… What does it mean to do undergraduate geoscience education in the 21st century? I don’t know if we have the answer – I don’t know if we’ll ever have the answer as our planet is constantly changing, technology is constantly changing… everything is changing through time! I do wish this Summit spent some more time talking about technology and its role in geoscience education – unfortunately, this is the second Summit in a row that has neglected to give adequate time and attention to this valuable topic. But now, it is time for me now to come back to campus (just in time, for the first day of classes!) and start thinking about establishing well-defined student learning outcomes (SLOs) for each of my courses that allow students to develop skills, competencies, and concepts that will benefit them in preparing them to be Earth science-literate citizens (and for some of them, to become professional Earth scientists! ).